The NBA 2K League, a joint venture between the NBA and Take-Two Interactive, is a professional esports league featuring the best NBA 2K players in the world. This is the first official esports league operated by a U.S. professional sports league. Brendan Donohue, Managing Director of the NBA 2K League, oversees all league operations. The 18-week season will begin Tuesday, April 2 with THE TIPOFF and will conclude Saturday, Aug. 3 with the 2019 NBA 2K League Finals. All NBA 2K League games and tournaments will be streamed on Twitch (tv/nba2kleague). Weekly regular-season matchups will take place on Wednesdays from 6-11 p.m. ET, Thursdays from 6-10 p.m. ET and Fridays from 6-11 p.m. ET. Teams will live in their home markets during the season and will compete in league play each week at the NBA 2K League Studio Powered by Intel in New York City. Four organizations have joined the NBA 2K League for the 2019 season: affiliates of the Atlanta Hawks, Brooklyn Nets, Los Angeles Lakers and Minnesota Timberwolves (Hawks Talon GC, NetsGC, Lakers Gaming and T-Wolves Gaming, respectively). 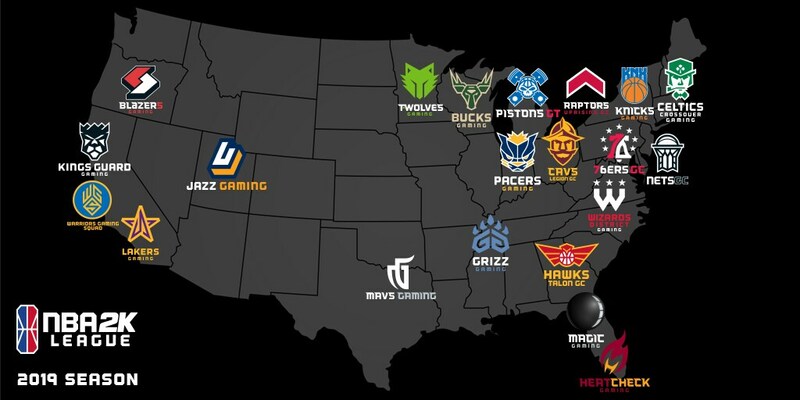 The 21 NBA 2K League teams are: 76ers GC, Blazer5 Gaming, Bucks Gaming, Celtics Crossover Gaming, Cavs Legion GC, Grizz Gaming, Hawks Talon GC, Heat Check Gaming, Jazz Gaming, Kings Guard Gaming, Knicks Gaming, Lakers Gaming, Magic Gaming, Mavs Gaming, Nets GC, Pacers Gaming, Pistons GT, Raptors Uprising GC, T-Wolves Gaming, Warriors Gaming Squad, and Wizards District Gaming. The 2019 NBA 2K League Draft took place on Tuesday, March 6 at Barclays Center. Jazz Gaming selected Spencer “Ria” Wyman of Shoreline, Washington, with the No. 1 overall pick. The 198 draft-eligible player pool consisted of 144 new players who were selected by the NBA 2K League after an extensive tryout process, six players from the league’s first APAC Invitational that took place in Hong Kong in February, and 48 unretained players from the inaugural season. The NBA 2K League Qualifier: In November 2018, players had to complete an online application and win 100 games in NBA 2K19’s Pro-Am mode or at the Jordan Rec Center, while winning at least 50 percent of their games. The NBA 2K League Combine: In December 2018, players, who completed the Qualifier, were required to complete a minimum of 25 games at one position, all during pre-set time windows. The NBA 2K League APAC Invitational, the league’s first-ever international qualifying event, identified several elite players from the Asia-Pacific region who became eligible for the 2019 NBA 2K League Draft. The inaugural season of the NBA 2K League culminated with the first-ever NBA 2K League Finals on Saturday, August 25, 2018. Knicks Gaming defeated Heat Check Gaming 2-0 to become the first-ever NBA 2K League Champions. Eight teams made the playoffs: Blazer5 Gaming, 76ers GC, Pistons GT, Raptors Uprising GC, Cavs Legion GC, Heat Check Gaming, Wizards District Gaming, and the winner of THE TICKET tournament: Knicks Gaming. 17 NBA teams participated in the inaugural season, which tipped off on May 1, 2018. Teams compete in 5 v 5 gameplay using unique characters (not existing NBA players). The NBA 2K League and the 21 teams have more than 1.8 million combined followers on social media platforms (Facebook, Twitter, Instagram). NBA 2K League content has generated more than 152 million video views across all NBA and NBA 2K League social media platforms (Facebook, Twitter, Instagram, Twitch and YouTube). NBA 2K is currently the highest-rated and best-selling sports title of the current console generation among U.S. sports leagues. NBA 2K18 sold approximately ten million copies worldwide and is the best-selling edition in franchise history. In 2017, NBA 2K18 was the top-selling sports video game in the U.S. and second best-selling overall (behind FIFA); 1.6 million daily active users; 5 million monthly. A number of NBA teams, owners and former players are already looking to the future of the esports industry, investing in esports franchises/holding companies.